Whoops! Maybe you were looking for Channel 9? Eddie McGuire (known in the industry as Eddie McEverywhere) is the name of a virus released by Kerry Packer that has infected every single show on the Eddie McGuire Television Service. 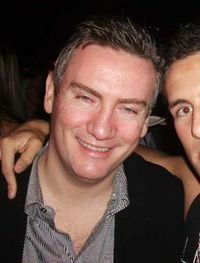 Eddie currently presents Today in the morning and National Nine News every evening, after which he hosts A Current Affair, (also known as "That Show That's Not Today Tonight"). Later in the evening Eddie appears on Nightline. A little known fact is that he also appears in the majority of the Guthy-Renker infomercials no one watches. That's right, for just 4,999 easy payments of $49.99 you could have beautiful, clear skin just like Eddie's! Eddie was created by Kerry Packer back when Channel 9 had yet to become the terrifying cult that it is today. 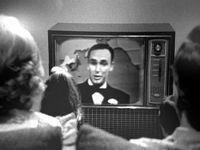 Eddie made his first appearance on Australian television in Sydney on September 16, 1956, when he announced "Good evening, and welcome to television." Since then he has shown no sign of slowing down. The next year Eddie hosted In Melbourne Tonight with Graham "The King" Kennedy and Bert "The Queen Consort" Newton. Eddie has hosted 60 Minutes every Sunday night since 1979, making him the record holder for the most minutes ever hosted. In 1994, Eddie began hosting The Footy Show, which covers AFL, NRL, and any other three-letter games that are popular at the time. Eddie has also appeared on Australia's Funniest Home Video Show since 1990, which is quite similar to The Footy Show. These days Eddie likes to host the show in a dress. Two years later Eddie began hosting Getaway, although he doesn't really get away, since he rarely leaves Nine's Studios, except to make appearances in the background of Channel 7 show Sunrise (doesn't everyone?). Eddie is also the presenter of the Australian comedy version of Who Wants to be a Millionaire, in which people pretend that they don't know the answers to the simple questions asked. For those without comedic tastes, the so-called experts at Wikipedia have an article about Eddie McGuire. Eddie is believed to be a long lost member of the Packer family, although some claim he isn't evil enough. In 2000, Eddie began hosting a new show, Backyard Blitz, which eventually became Domestic Blitz. Eddie was charged for this but later let off, using the well known "but I'm an Australian media personality!" defence previously perfected by members of The Chaser. Eddie has also been known to get into violent brawls with Sunrise's David Koch. However, he has never been charged for this, because no one likes Kochie. Eddie will probably be best known for his priceless reaction at the 2010 Brownlow Medal on finding out that Dane Swan did not win. He cried for 10 hours on end after going home in a bad way. This page was last edited on 1 April 2011, at 15:09.